Y’all know that Tex-Mex food is a cuisine in a league all its own, right? It’s not some fusion of half Texas food and half Mexican food stirred together. Tex-Mex food includes favorites like tortilla soup, carne guisada, refried beans, crispy tacos, cheese enchiladas with chili gravy, migas and more. Are you hungry yet? It takes a special kind of dessert to follow such spicy food—a dessert that also has a little kick to it. I’m going to let y’all in on a little secret: Texans sprinkle cayenne pepper and chili powder on their chocolate desserts. Yep, it’s true. Just ask your favorite Texan. They’ll tell you that the combination of chocolate and spice creates a sweet burn that is unbeatable. The thing about sweet heat is that it keeps you comin’ back for more. Don’t say I didn’t warn you now: these cookies are addictive. In a medium bowl cream together with an electric mixer the butter, shortening and sugar. Beat this mixture very well, for 1 full minute. Add the egg yolk and vanilla and beat until just combined. In a small bowl, whisk together all remaining ingredients. Add this mixture in 2 batches to the butter mixture, beating until just combined. Using a teaspoon scoop, measure 2 teaspoons of dough into your hand. Roll into a ball and place on cookie sheet. Bake for 11-12 minutes if you want your cookies fudgey in the middle. They will just be beginning to crack. Bake about 1 minute longer if you like your cookies firmer. Let cool on cookie sheet before transferring to a wire rack to cool completely. I totally did not know that about Tex-Mex! Got to explore this further. I love spice and chocolate – sometimes I add some cayenne in my chocolate milk. The cookies look delicious. I love mixing chocolate with spices! It just gives a unique flavor that can’t be beat! These cookies sound so delicious! I’ve never had a spicy cookie but I’m intrigued! I recently tried a similar recipe from Martha’s site, but this looks EVEN BETTER. I think I would love the addition of the espresso into the cookie. Love the photo too, it’s beautifully shot! this sounds just lovely! i cant wait to try it out. thank you for sharing this. chocolate and spices, a perfect combo…we use them in sweet and savoy..yummy!! Yum…I love the dash of heat in these. Cayenne in chocolate cookies!!!! Great idea!! I have had it in a chocolate bar, but never in a baked good. Mmmmmmmmmmmmm! 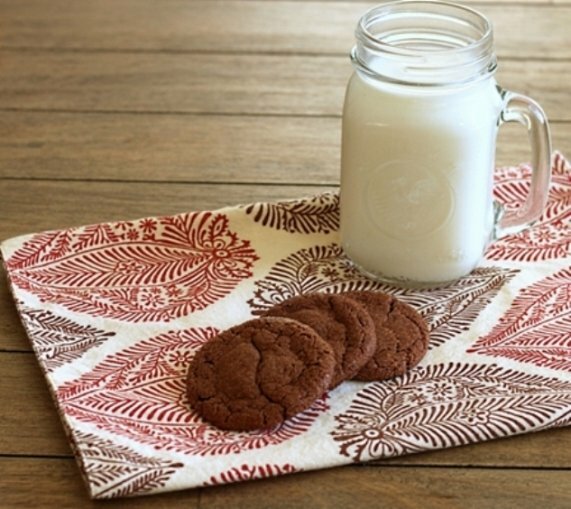 Cayenne is such a great addition to cookies. In small amounts it makes a subtle undertone that keeps people guessing! 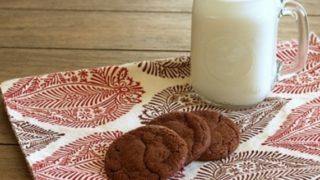 I love spicy cookies and with chocolate, sounds even better! mmm I love the spicy chocolate mix! And I love that it only makes a dozen!! Never tried spicy cookies, I think it’s time! Wherever the idea of chocolate and cayenne originated (Ancient Aztecs? Mexico? Texas?) — YES! I love a spicy cookie! These would be great with some kicked-up hot cocoa (with a bit of cinnamon and chipotle). Yum! looks like i need to go to texas! to be honest, i’ve never tried a spicy/sweet dessert! your site is wonderful to come to for downsized desserts! I love a hit of cayenne and espresso with chocolate! These would be perfect after some spicy enchiladas. I’ve had tex mex but definitely not the real thing! And I’ve never had cookies with a kick either! Sounds delish. uh yum!! And a batch that’s just the right size! These remind me of the Mexican Hot Chocolate cookies I made! Love the chocolate/cinnamon combo! This sounds like a great cookie; spicy things really boost the flavor of chocolate. By the way, we have the exact same glass as you! Yum! I’ve been looking for a complement to lemon spice cookies and these seem to be it! !